What is the Best programming Language to Learn? How to Stop Being Nervous All the Time? What Do Engineers Do and Where Do Engineers Work? How to Improve Concentration and Memory Easily? Mean Girls at Work – How to Best Deal with Them? What Is An Internship and What Do Interns Do? How to Become a Full Stack Developer? What is the Difference Between Enquiry and Inquiry? One of the best ways to get a job the smart way is to get it through the back door, that is the unlisted way, and we call it the unlisted jobs. Now, if you are smart enough, you would rather invest less time searching and convincing people for unlisted jobs than finding and screening through the listed openings. The reasons are obvious. 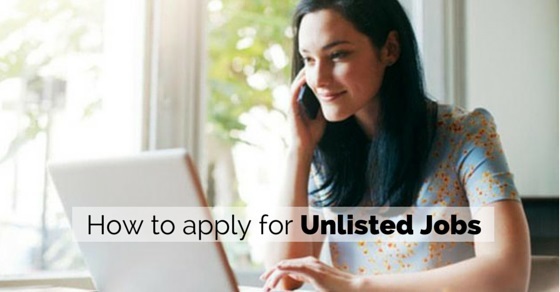 When you are looking for an unlisted job, you are quite a few steps ahead than a general jobseeker, and know that you are going to crack through the opening somehow as you know someone in the company. If you are a new or fresh jobseeker, then you will be amazed to know how much prospect an unlisted job offers compared to listed jobs. The unlisted jobs are those jobs which are available only through internal contacts in a company, something like internal hiring. It happens that there comes unspoken openings in a company, and people do not talk much about it outside because of several reasons. It’s only in the inside that a lot of hush hush about the job continues. It is something similar to internal hiring. Only the people from the internal departments do get to know about the job. In many cases, even the HR never gets any information that one or two positions are there or are going to open up in the organization. It happens because of several reasons, like sometimes that the manager wants to get rid of an employee, or has the intimidation that a certain employee is going to leave. When the manager or the higher authority is looking for a replacement for that employee, and do not want the news to come out loud, maybe because of the company’s reputation, or just because he doesn’t want just any unreliable person to occupy the position of high load and responsibility. In all such cases, the company does not let the news to get out, and people only related to the concerned department get to know about the opening. Then they also look for people whom they know in turn, and look for suitable candidates who are reliable. In this process, outsiders do not ever come to know that there is some sort of opening in the company, and only people who are attached to the inner processes gets an opportunity to get through the selection process. Hence, there are certain rules that will make you more close to an unlisted job, and all you will have to do is follow these unspoken rules and watch the magic work gradually. In a few days, you will also be getting an entry through the back door and will be cracking through an unlisted job. Research a lot about the company, and the various jobs, that are being carried out there. Now, if you know very well about the company prospect, you will be able to get a clearer picture about the workings there. It always keeps you a step ahead, and you can track the people in the company and their profiles through the job type. Collecting information about the company from newspapers, the internet, business magazines, press conferences and online PRs always helps and keeps you updated about internal turmoil. Whenever you come to know that there is an internal turmoil going on in the company, you will be able to smell some hidden openings inside. Now when you are planning to apply for some position in a company, then you must know what the name of the person who will be addressed is. There is some information that needs to be collected before you apply for the job or even write a letter. You can always call the reception and then ask the operator these few questions. You can learn from the operator that whom to address, what is the name, and what is the designation of the person, who will be looking after the hiring process. The information is highly essential, as it brings you a step ahead to the right application process and format. In such cases, the application to the concerned person in the right way is important, as it doesn’t get filtered through thousands of other applications, and only a few applications are deposited to the organization at a time. While you write the letter, make sure that you put the same date on which you actually send or put in the application. The full name of the addressee, the company name, all are important, and should be put in orderly. Clearly mention which post you are applying for, or what rules you are interested in. This will help pin point the fact that you are interested to work in a certain department in a certain job role. And it will open up more avenues for you to get the unlisted job in the concerned department of the company. Make sure that you write the letter professionally. When you are applying for an unlisted job, you are supposed to be a pro, who knows handling official letters, addressing it properly, and closing the letter well. Mentioning other details such as your full name, address, email, phone no., date of birth are other important things, which you cannot afford to overlook. Making a carbon copy of the letter, and submitting it to the HR, or the recruitment division is equally important. This leaves a dual impression or mark, and you are sure that you have applied both internally for the unlisted job, as well as have arranged for focus if they are listing the job in future. The last thing is follow up. You must not forget to follow up with the company. If you leave the trail of follow ups, you may annoy a people or two, but you will keep on leaving the impression, and they won’t forget your candidature. Thus it’s important that you keep on following and keeping track of what is going on within the company. Last thing to keep in mind is to use social media sites like LinkedIn and Facebook, where you can get in touch with the employees of the organization where you dream to work in. The more people you know of the organization, the more is your exposure, and chance of getting referred. A reference by an internal employee brings on a big chance for you to get the unlisted job. Hence you must try to get and know more people of the organization, and build up a rapport with them on time. Frequent interaction, talking about the job role, showing support on their projects are various ways of getting friendly and acquainted with the people, and this will yield on time, if you build the relationship properly and diplomatically. A combination of all these strategies, where you do research, apply orderly, follow up on intervals and make relation with the company staffs, builds up the proper setup of your selection for the unlisted job. What is the Difference Between Job Career and Profession? How to Implement a Buddy System at Work? How To Speed Up Your Career Progression?